We go to the nations every year on short-term mission trips through Ambassadors In Mission (AIM), the short-term youth missions program of the Assemblies of God. We encourage every student to go on a foreign mission trip before they graduate high school. First deposit (non-refundable) of $50 is due January 16, 2019. Cost includes: travel (in-state) food, amenities, and insurance. First deposit (non-refundable) of $195 is due January 16, 2019. Total payment is due: May 22, 2019. Cost includes: airfare, tourist visa, ground transportation, housing, food, insurance. Must have passport for traveling outside the country. We are leading on a return trip January 14 - 21, 2019. with AG World Missionaries, Johnny and Andrea Pangelinan. We will be serving the established church as well as reaching areas that have yet to be reached with the gospel. We only have a few spots left for students and leaders, so please contact team leader, Brandi Martinez, ASAP if you are planning to join us. For more information, contact Brandi Martinez ASAP. We are leading a more advanced AIM trip to Egypt April 8 - 15, 2019. Experienced sudents (ages 16+) and leaders will take part in a team in serving an international church partner in Alexandria, Egypt. Due to the nature and sensitivity of this trip, information can be requested by those seriously considering applying for this trip. Members will gain exposure and context to the Arab World, capturing stories of STL and serving the Christian church. We will also have the opportunity to visit ancient pyramids in Giza and a tour of Cairo. First deposit of $195 (non-refundable) is due: December 3, 2017. Total payment of $2,495 is due: March 11, 2019. If you would like to lead a team or go on a future AIM trip, e-mail bgraff@azag.org or call 602-343-4000. AIM started in 1966 and now nearly 10,000 students participate on these trips each year. AIM is a coordinated effort between students, leaders, missionaries and host churches. With Assemblies of God missions in over 250 countries, the opportunities are endless. There are 5 requirements for using the term "AIM". 1. Receive an invitation in writing from the AGWM missionary you will work with for international trips or the district and/or home missionary for domestic trips. 2. Notify your Network Youth Director (Griffin McGrath) in writing of your trip plans. 3. Complete the AIM Outreach Form. FAX or mail the form and invitation to the national AIM office at least 60 days prior to your trip. 4. Obtain short-term trip insurance from Brotherhood Mutual (800.876.4994) for overseas trips. For stateside trips, contact Special Markets Insurance Consultants (800.818.7642 ext. 3). Be sure to ask for "AIM Travel Insurance". 5. Complete the AIM Outreach Report/Total Missions Giving Credit form and return it to the national AIM office no later than 30 days after the completion of your trip. This form is available in the AIM Outreach Packet. To receive guidance or suggestions on making your AIM trip a success, e-mail the national AIM office or call 417.862.2781 ext. 4039. 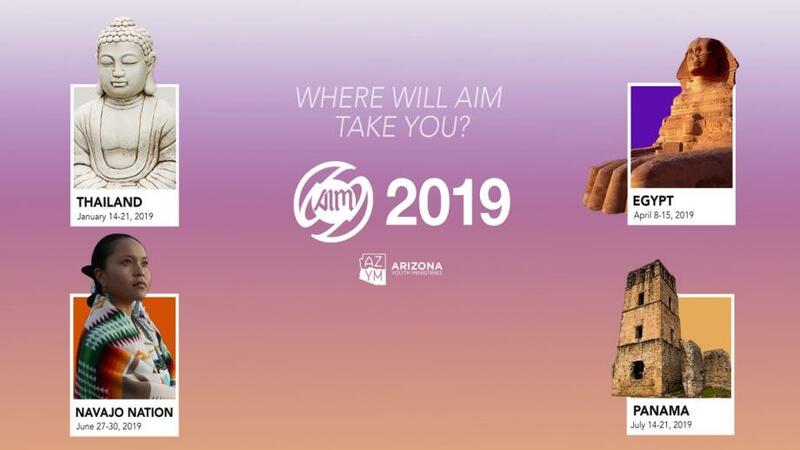 Some Assemblies of God Colleges and Universities offer scholarship money if a student as been on a registered AIM trip.